Sydney has a solid floor with a few cracks. Propertyology has expressed concern about Sydney’s property market for a couple of years. In February 2015 we released a market report wherein we described Sydney as a House-Of-Cards property market. Flagged in our initial report as a possible ‘card’ that could be played, credit policy tightening was enforced by APRA from May 2015. Also flagged in our report, conditions for Asian investors are not as robust now as they were, although there is no suggestion of alarm bells. While we see no genuine cause for claims of ‘the bubble bursting’, a couple of Sydney’s underlying fundamentals remain fragile. After a long run where the NSW unemployment rate was above the national average, courtesy of a strong services sector, Sydney has evolved to recently take the mantle of Australia’s economic powerhouse. It is no coincidence that Sydney’s property market has been strong with the jobs numbers in this chart. Yes, there are a few very good transport infrastructure projects now under construction however, it is highly likely that Sydney’s horrendous traffic congestion, loss of productivity, and high fuel costs will always be the worst in the country. 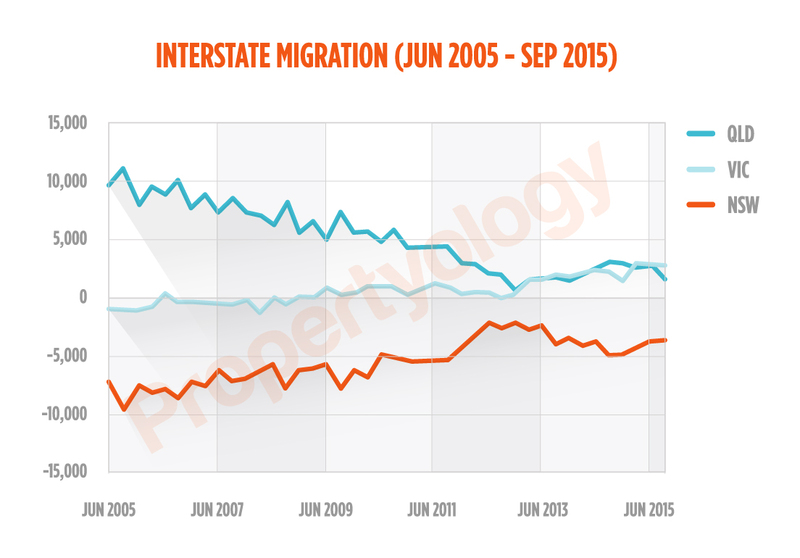 And, the trend in that earlier Interstate Immigration graph is likely to continue. 20-odd years of babble about Sydney having run out of land and therefore having an under-supplied property market is exaggerated. Just pause and think for a minute about cities like New York, London, and Singapore. The collective minds of developers and city councils will always find ways to keep building properties. Metro Sydney’s land shortage will continue to be compensated by sprawl in the west and higher density construction. 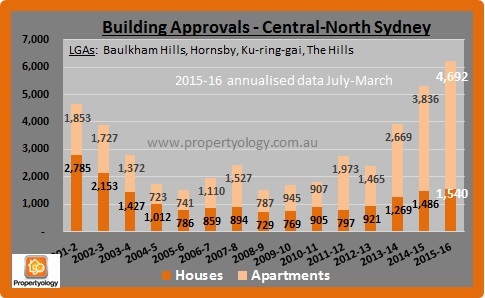 For all bar one of the last 15 years, 60-65% of all new dwellings approved in Greater-Sydney were apartments. Affordability, proximity to jobs, transport considerations, and increased demand from Asian buyers is likely to see this trend continue. The average number of new dwellings approved in Greater-Sydney each year for the ten years ending 2011 was 22,555. The annual average for the following four years (2012-2015) was a significantly higher 38,225. The trend is not abating either – 51,106 dwellings were approved in 2015 alone. As Sydney’s housing supply pipeline ramps up its population growth rates (demand) remain in line with historical averages. This is new territory for Sydney. Things are out of sync! The official data analysed by Propertyology leaves us in no doubt that several pockets of Sydney will become over-supplied. Queue lobby groups and vested interests who’ll now shout loudly in denial. 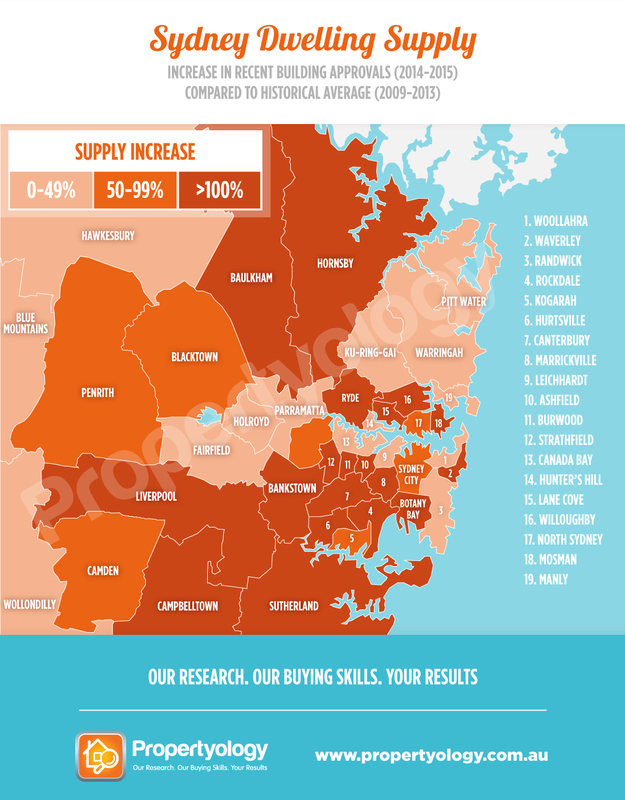 Drilling down for a more localised analysis of supply, Propertyology has compared the current supply pipeline with historical trends for each of Greater-Sydney’s forty-three (43) local government authorities (LGAs). 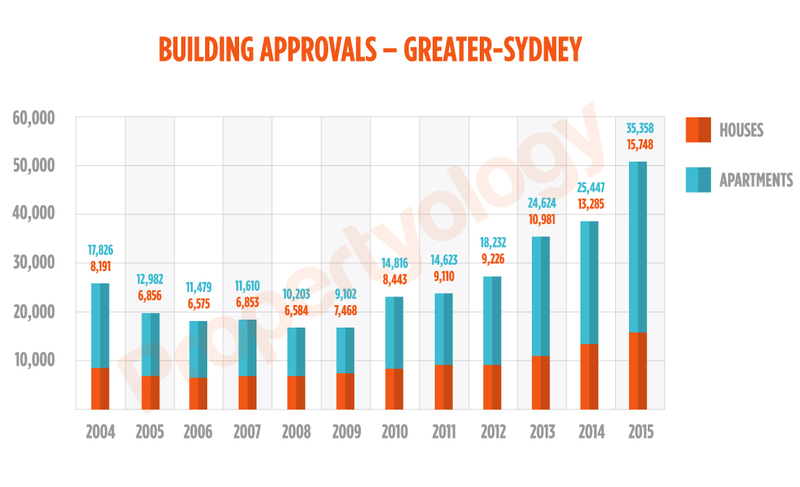 When comparing the five-year annual average from 2009-2013 to the annual average of 2014-2015, eighteen (18) of Greater-Sydney’s LGAs have an increase in building approval volumes of 100% or more. In other words, double the amount of normal supply will be progressively rolled out over the next couple of years. A further ten (10) LGAs have approved more than a 50% increase in new dwellings. 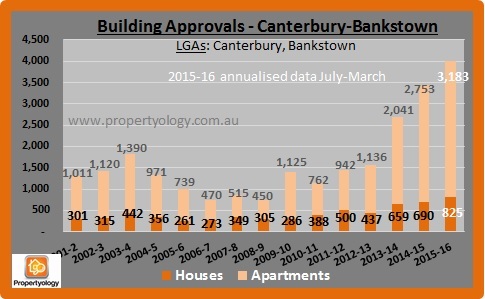 The trend for increasing building approvals is continuing during 2015-16 financial year. Structural changes resulting from the revolution known as the ‘Asian Century’ has directly resulted in unprecedented volumes of properties being purchased in Australia by Asian investors. 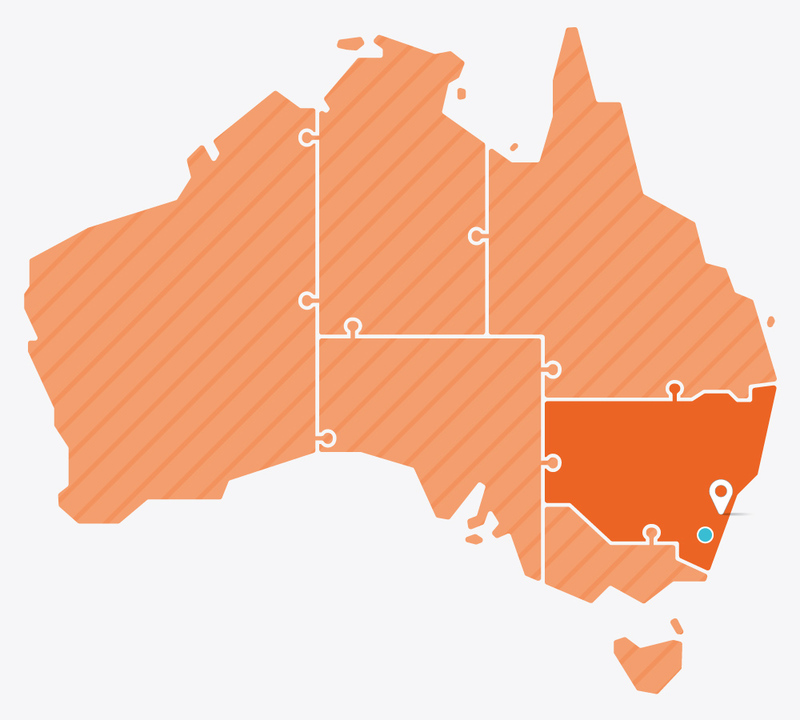 With Sydney and Melbourne having Australia’s biggest profiles internationally, they have been the centre of attention for the construction industry’s marketing teams. In a majority of cases, Asian investors buy brand new properties – only Australian residents are permitted to buy established properties. Following a 1% decline in median values in 2011 and zero growth in 2012, unprecedented demand for Sydney property by Asian investors kick started Sydney’s 3-year property boom with 12% growth in 2013. The significant increase in property holdings to Asian investors does pose some risk if significant destabilisation in Asian economies were to occur. We know that, when times get tough, investment properties are often one of the first assets disposed of in order to bring the household budget back in to order. High levels of resale stock never plays out favourably on property prices. There have been reports that Sydney’s largest developer, Meritons, sold as much as 80% of their new apartments to Asian buyers over the last few years. But, tougher conditions around getting money out of China and recent tightening of Australian credit policies to foreign buyers is likely to result in an easing in sales volumes to Asian buyers. While not as big as the early 2000’s boom the performance of Sydney’s property market from 2013 to 2015 was still spectacular. But, contrary to tabloid rhetoric, outside of Sydney, most property markets experienced modest rates of growth and plenty of markets experienced price declines. Propertyology anticipates that Sydney’s general economy will continue to be amongst the best in Australia for the foreseeable future however, we also anticipate that property price growth will be moderate with potential for several pockets to experience price declines. Some off-the-plan buyers with settlements due in 2017 and 2018 risk losing their deposit as a result of tighter credit policies subsequent to the initial exchange of contracts and / or lower valuations in some of the potential over-supplied pockets of Sydney. Sydney rental yields are already amongst the lowest in the country and, generally speaking, we believe that there will be some easing of rents over the next few years. During Sydney’s recent boom there were a high proportion of buyers who were investors (home loan approval data suggesting as high as 60% whereas 30-35% is about normal) meaning a lot more rental stock. History has taught us that the biggest driver of housing demand is ‘affordability’. Propertyology’s biggest concern for Sydney is interest rate risk. During this period where we are experiencing the lowest interest rates in Australian history some have forgotten that Sydney has officially the least affordable housing in the country. 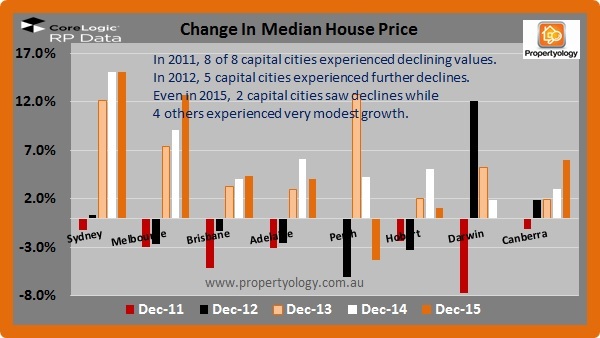 This is the primary reason why, from 2000 to before the recent boom, Sydney produced an inferior average annual rate of price growth to all other capital cities. In a market where many households are managing a mortgage of circa $800,000, it wouldn’t take many interest rate rises to put the Sydney property market back on its knees. Rate rises may not be likely to occur in the short-term, history has taught us things can change pretty quickly. When they do, Sydney’s property market will feel it more than most. This is the first property that PROPERTYOLOGY have purchased for our client Jessica, a young New South Wales based investor, who was referred to us by her finance broker. Jess was looking for assistance in setting up her financial future by purchasing another investment property.